I am absolutely thrilled about this post! I usually don’t publish blogs linked to special celebrations such as Thanksgiving, Christmas, or 4th of July. However, this Valentine’s Day will receive special attention from the Bewitching Kitchen. I was invited by Jamie (who hosts the great blog “Cooking in Red Socks“) to write a collaborative series of posts to celebrate it. So here is the deal: we will both be blogging three days in a row to cover the appetizer course, dinner, and dessert. My posts will center on a romantic meal for two. Jamie will blog on the same courses, but her posts will be about Valentine’s Dinner for Friends. Her posts are made super special as one of her best friends, Allie, celebrates her Birthday on V-day. How cool is that? 😉 Make sure to stop by her blog and marvel at her choice for the appetizer course: Sun-Dried Tomato Palmiers… WOW! 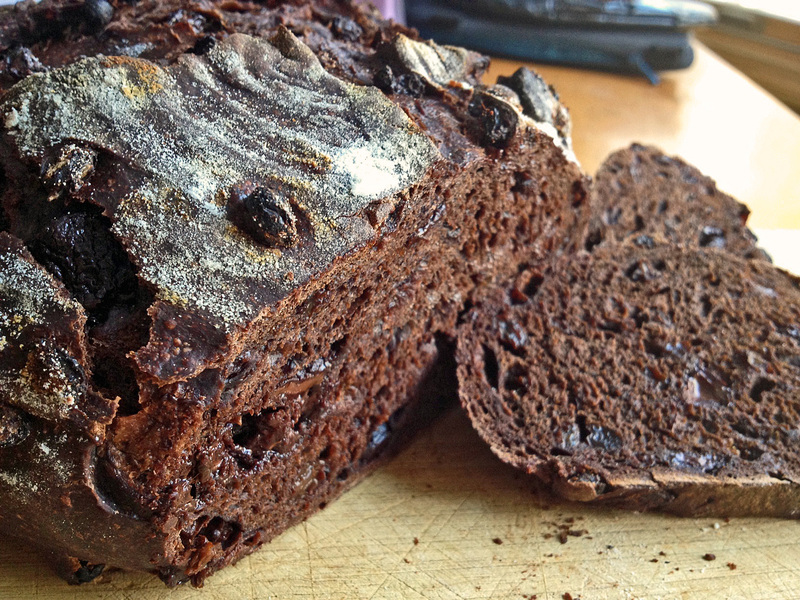 To start the day on a great note, I offer a perfect Valentine’s Day breakfast bread: Chocolate Currant Sourdough. A slice, slightly toasted, and a cup of hot cappuccino: heavenly! Recipe overview: This bread takes a regular sourdough starter, at 100% hydration. 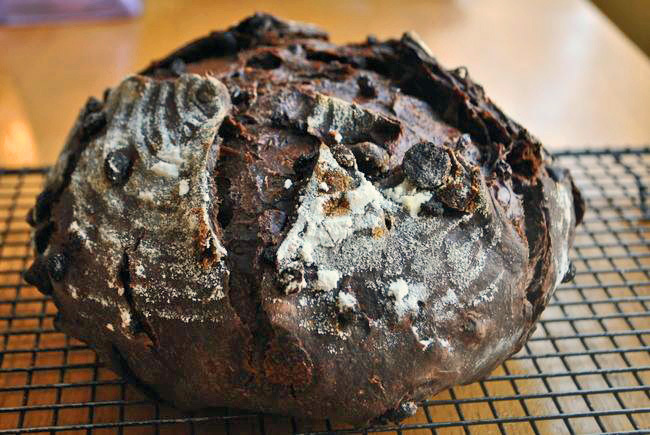 The starter is incorporated into a final dough containing white flour, cocoa powder, chocolate chips, and currants. After a series of foldings, the dough is shaped, either as two small loaves (as shown in Farine’s blog), or as a large round boule (as I did). My shaped loaf fermented for 4 hours in our bread proofing box, temperature set to 78 F. I baked it inside a covered clay pot for 30 minutes at 435 F, then removed the lid, and baked for 15 more minutes. For the detailed recipe, visit Farine’s site or get your copy of Emmanuel Hadjiandreou’s book. Both links are included underneath the recipe’s title. 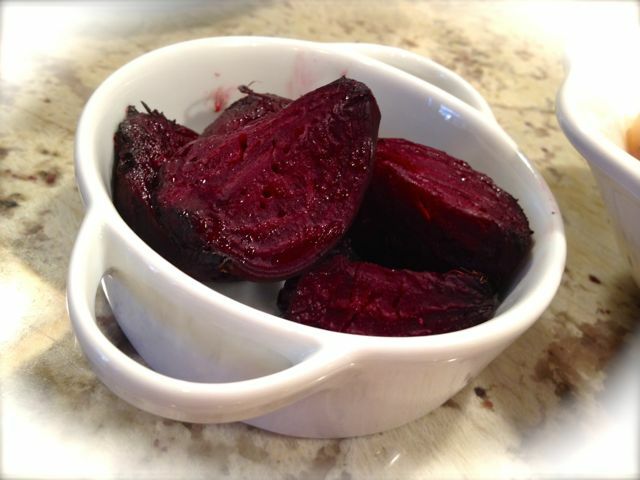 Peel the beet, cut it in quarters, coat with a little olive oil, season with salt and pepper. Place in a roasting dish covered with foil, and roast at 400 F for 30 minutes or until fully cooked through. Comments: Phil is not too fond of beets, so I took a risk by choosing it for a Valentine’s Day menu. 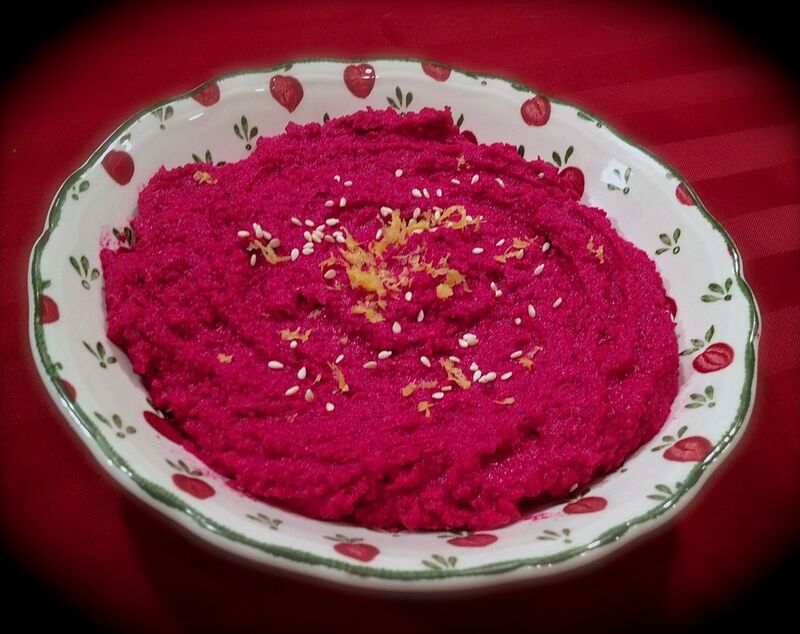 But the flavor of this spread is very complex, and the beets stay mildly sitting in the background, their presence big in color but mellow in flavor. Perfect for those who don’t jump up and down with joy when such bright red beings are found in the middle of the groceries. Serve this spread with crackers, or for a lighter appetizer course, celery or carrot sticks.